Get a job, work there for a few decades, retire at 62 and then reward yourself with travel. Does that sound like you? Didn’t think so. We believe you should live the life you want, not what others deem to be appropriate. Your job is to imagine the possibilities of your life, and our job is to put you on the financial path to get there. That’s why we’ve built a planning experience to help you achieve a range of life aspirations, including homeownership, covering your kids’ college costs, and an early retirement. But recently, we’ve heard a strong desire from many of our clients to explore one particular possibility – taking extended time off from work to travel. You don’t want to wait until the traditional retirement age to see the world, but you might not be sure if you have the financial means to go on that big adventure now. So to help you with this challenge, we’re excited to introduce the newest addition to our planning experience – Time Off for Travel. It’s easy to dream about extended travel, but then reality hits and you’re left with questions. How much time off can I afford to take? Will it affect my lifestyle when I return? How frugal will I have to be on the road? That’s where Time Off for Travel can help. 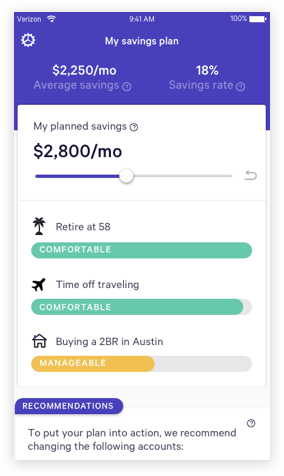 By connecting to all your financial accounts, Wealthfront has a bird’s-eye view of what you have today and what you’re expected to have in the future. We can immediately tell you how long you can afford to travel without putting your long-term financial security at risk. When can you afford to leave? Immediately or maybe in a few years? How long can you afford to be away? Just a few months or more than a year? What will your travel style cost you, whether it’s hostel hopping or luxury rentals? Can you expect any income while you’re away? Any freelance projects or subletting your home? As you explore the specific details with Time Off for Travel, we’ll help you understand how these different aspects affect the affordability of your trip. We’ll even let you know how the scenario you’ve imagined will impact your ability to retire the way you want. We also provide actionable advice on how you can make your extended trip a reality. We’ll tell you how much to save per month to cover the cost of your trip while staying on track for other goals like buying a home or an early retirement. We were particularly excited to build Time Off for Travel because we could sense our clients’ passion when they spoke about this specific ambition. Today, we celebrate those who’ve forged unconventional paths by sharing four stories about the value of extended time off. We found these travel experiences truly inspiring, and we hope you will as well. We admire those who dare to imagine, and we built our financial planning to make their dreams a reality. As you start to explore your dream trip, let Time Off for Travel help you navigate the financial considerations to help you achieve it. Now, if you knew you could, where would you go?